The Obama administration is struggling to explain why it is pressing Congress for more money to fight the Zika virus while sitting on hundreds of millions of dollars that it already controls and could be used instead. White House and public health officials on Friday came close to publicly demanding that the House and Senate interrupt a seven-week recess and return to Washington to give federal agencies up to $1.9 billion to counter the mosquito-borne virus. President Barack Obama and administration officials have for months urged lawmakers to simply approve a $1.9 billion anti-Zika plan they submitted in February. House Republicans balked at its cost, and approved a $622 million measure; the Senate passed a bipartisan $1.1 billion bill. A compromise bill that Democrats say Republicans worked out among themselves matched the Senate level of funding, but Democrats and Obama said the measure contained unrelated policy provisions. The bill would also offset the Zika dollars with cuts to other federal programs, like the House bill but unlike the Senate version. The bill died before lawmakers left Washington late last month. In the early days of the congressional break, the White House released $60 million of the $589 million it shifted from other health programs to Zika accounts earlier this year. In recent days, Florida state health officials have confirmed nearly 15 cases of the virus being transmitted inside the United States. Administration officials say this increases the urgency for more funding. Federal officials on Monday issued an unprecedented warning, telling pregnant women and their sexual partners to avoid an area just north of Miami&apos;s downtown. The White House could tap into the $400 million that remain of the previously reprogrammed funds. An Office of Management and Budget spokeswoman confirmed Friday that $385 million is still in that account. The administration does not need congressional approval to decide how to spend the money. Schultz sidestepped a question about why White House officials have not tapped the remaining $385 million in unspent funds faster. And Schultz again hit lawmakers for failing to give the administration new monies to spend against the virus, which has been linked to major birth defects. “The keys here are sitting with Congress, and they have to turn them to unleash more federal funding,” he said. That is true when it comes to allocating new funds to combat the virus. But the administration holds all the keys when it comes to the remaining $385 million. That raises questions about the urgency with which the White House is pushing for funding, especially after the confirmed Florida cases. While Schultz stopped short of saying Obama wants lawmakers to return to Washington for a special Zika session, he did call on GOP House members from Florida to alter their collective stance and support the administration&apos;s $1.9 billion Zika funding request. In contrast, Florida Sen. Marco Rubio supported the Obama administration’s initial request and has sharply hammered his colleagues over their inability to pass anything to combat the virus. Last Thursday, Rubio pressed the president to distribute a batch of funding already under its control. “I urge you to encourage all relevant agencies to use the funds currently available in the battle to contain this illness as expeditiously as possible,” Rubio wrote in a letter to Obama. 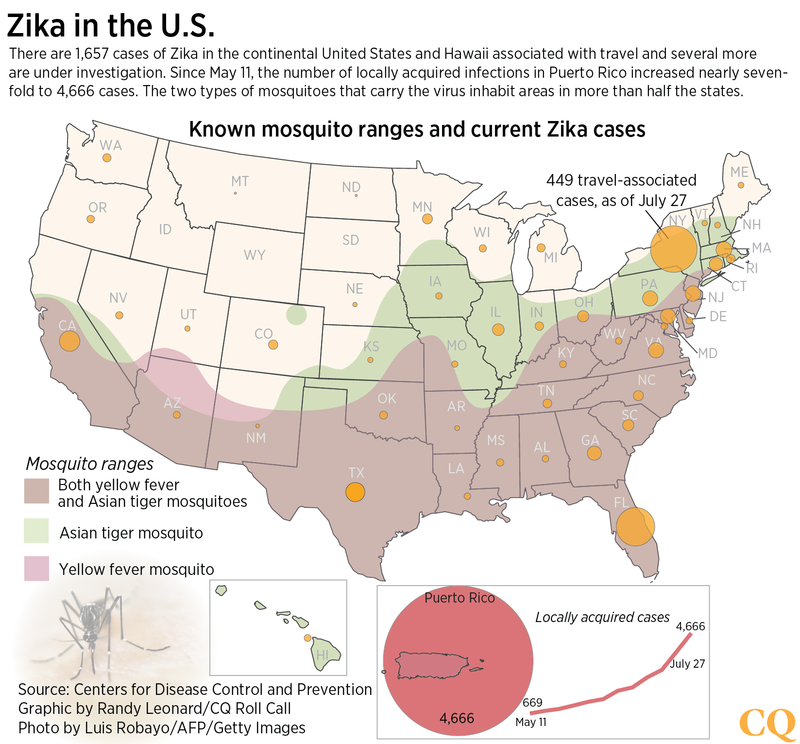 “This issue is only magnified as we enter deeper into the summer mosquito season and have had possibly the first locally transmitted case of the Zika virus in Miami, Florida." Rubio and other Republican lawmakers have spent weeks during the mosquito season pressing the administration to release more of the reprogrammed funding. “Everyone agrees that fighting Zika is critical, and agency officials have been sounding the alarm, but the agencies have been slow to distribute available federal funds to fight the illness and short on effective strategies and information to the public," Sen. Charles E. Grassley of Iowa wrote in a letter to CDC and Department of Health and Human Services officials. "The taxpayers have the right to expect that these agencies are ready to protect all of us from public health threats," he wrote. Grassley&apos;s office says the senator has yet to receive a response. Contact Bennett at johnbennett@cqrollcall.com. Follow on Twitter @BennettJohnT .